Up first, join Housing Secretary Raymond Skinner for this week's installment of Spotlight on Maryland Housing. Up first, join Housing Secretary Raymond Skinner for this week’s installment of Spotlight on Maryland Housing. Then, Investigative journalists Melody Simmons and Joan Jacobson teamed up for a groundbreaking new look at the nation’s biggest urban redevlopment project – a $1.8 billion project right here in East Baltimore. Their five-part series in the Daily Record started this week, and they joined us to discuss questions about how public money is being spent, a misled public, and a project far behind its original schedule. To read the series, Too big to fail? 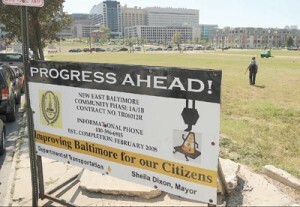 Betting a billion on East Baltimore, click here.